The couple originally reported they were attacked in January at a bar in Downtown Austin for being gay. 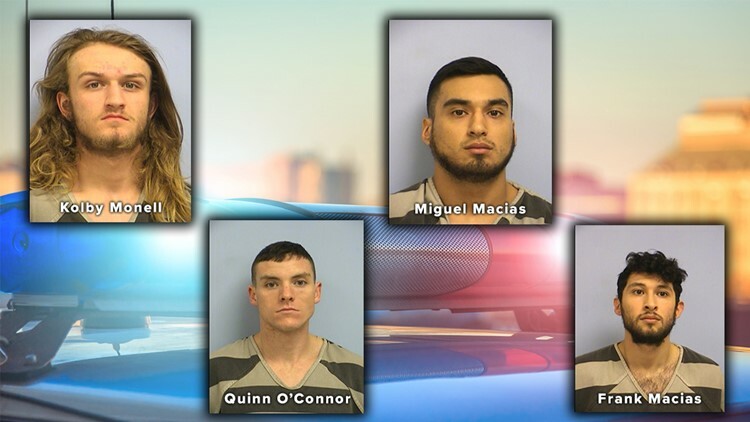 AUSTIN, Texas — Four people have been arrested and charged for reportedly attacking a gay couple in an alleged hate crime that took place in Austin in January. According to an arrest affidavit, Frank Macias, 22, was arrested and booked into the Travis County Jail for assaulting the couple on Monday. He has been charged with two counts of aggravated assault with a bond set at $150,000 for each charge, according to online records. The remaining three suspects, Quinn O'Connor, Miguel Macias and Kolby Monell, were arrested on Tuesday. They face the same charges. Frank Macias identified Miguel Macias as his brother, according to court documents. The Austin Police Department credited a Crime Stoppers tip that greatly helped in locating the suspects. 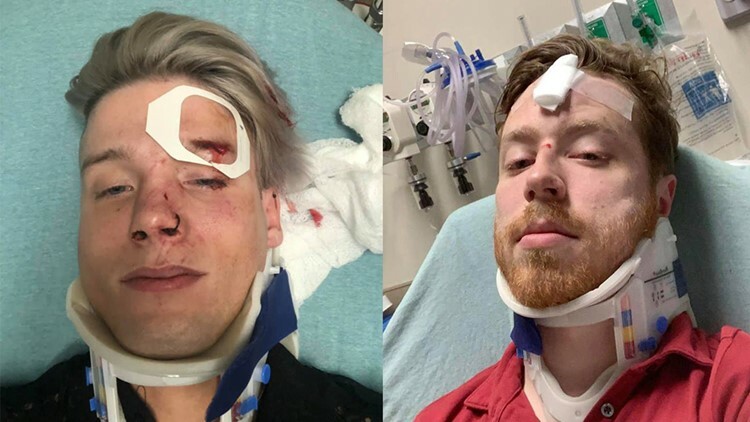 The couple originally reported they were attacked on Jan. 19 at a bar in Downtown Austin for being gay. According to the affidavit, the attack happened just before 2:30 a.m. on Jan. 19 at the corner of Third Street and Congress Avenue. Spencer Deehring and his boyfriend, Tristan Perry, told KVUE as they were leaving a bar holding hands, a man approached them and used a bigoted slur. The couple reportedly questioned the man about what he said and, within a few seconds, there were "four or five guys there with him." After the couple realized it was a group of individuals, they continued walking and the group allegedly continued yelling homophobic insults at them. Perry then began verbally defending himself when he said he was punched by a man and fell to the ground. Police said that man was described to be muscular with dirty blonde hair that was shoulder length. The affidavit alleges the group of people then started punching and kicking Perry. As Deehring attempted to defend Perry, the group of individuals began assaulting him as well, according to the affidavit. The couple was continually assaulted until a witness intervened, police said. The attack reportedly left Perry with a bruised eye socket, concussion, internal bleeding, a broken nose, a busted lip and chipped teeth, while Deerhing suffered from a concussion and injuries to his neck. The witness reportedly told police he saw a group of four to five men verbally abusing and assaulting the couple, but stopped once they saw one of the victims pulling out his phone to call police. Upon further investigation, police obtained surveillance video of the attack, which reportedly shows the couple being followed by a group of people and the assault. Other surveillance video captured the suspects running away from the scene. Police said a tipster identified Macias as one of the suspects as well as another man. During a meeting with police on Jan. 24, Perry and the witness were able to positively identify Macias as one of the suspects. The Austin Police Department said they are investigating this attack as a hate crime. Travis County District Attorney Margaret Moore also said she is confident they will find this as a hate crime when indicting the suspects. "To the victims, Spencer and Tristan, we took this case very seriously and we worked a lot of hours to solve this case," Assistant Chief Ely Reyes said at a press conference Tuesday afternoon. "Hate crime is a very serious crime, and not one that will be tolerated here in the city of Austin." Spencer and Tristan did not want to speak with the media following the news of the arrests, but they wrote on Facebook they are thankful for everyone involved in catching these four suspects. If you have any information regarding this attack, call the APD immediately at 512-974-9207, submit tips via Crime Stoppers at 512-472-TIPS, text "Tip 103" your message to CRIMES, or use the new Crime Stoppers App. The Austin Police Department said they investigated 19 hate crime cases in 2018 and 17 in 2017.